As any experienced integrator will testify, the need to fully test AV installations is essential to ensure the highest possible system performance for the ultimate, trouble-free, end user experience. Having a trusted piece of test equipment which can interrogate both hardware and cable infrastructure is crucial to help troubleshoot and diagnose any potential signal issues, thus enabling an effective and efficient install process. With the increase in 4K compatible products, managing signals and ensuring compatibility of all the hardware is particularly important. Offering over a thousand different combinations of test scenarios, our new 4K compliant XA-4 Advanced HDMI Pattern Generator and Analyser offers 54 resolution settings, 47 test patterns and 6 analysis tests, making it the perfect test tool for any AV installation scenario. With support for HDMI2.0, HDCP2.2, HDR and 4K timings including 4K@60Hz (YUV4:4:4) 8-bit for full 6G signals, this device has all of the latest technology and features packed inside. 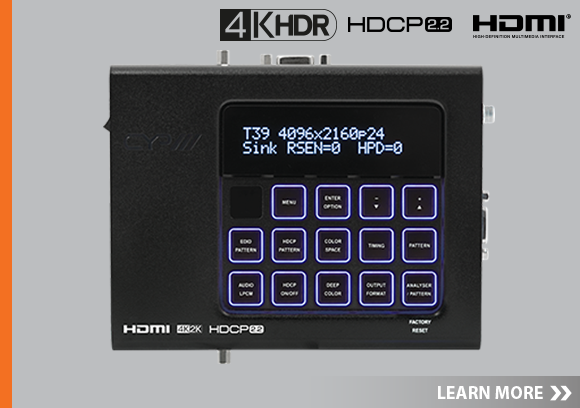 As well as supporting HDMI data packets, the XA-4 provides EDID and HDCP analysis, EDID emulation, audio test signal generation for up to eight channels, cable testing, and error logging capabilites. Front panel keys allow fast switching between the various functions and an OLED screen allows for quick viewing of current status information. Control is via front-panel buttons, IR, RS-232, and Telnet allowing users full flexibility in controlling the device. Our XA range of HDMI tools are an installers best friend in any AV environment and are in stock now. For more information on the XA range of solutions, click here.